One of the leading MMA nutritionists shares his thoughts on the right way to lose weight. Cutting weight has long been ingrained in the culture of professional combat sports. Today the vast majority of fighters still seek to exploit the day before weigh-ins and by cutting weight, give themselves a clear size and strength advantage over their opponents. Believe it or not, some fighters worry more about making weight than they do about their opponent. Cutting weight can undoubtedly be a cruel process and it’s no secret that it isn’t always undertaken in the most professional manner. Some athletes will practically starve themselves, use saunas or sweat suits and some have even taken drugs amongst other drastic measures in order to reach their goals. One man who is well acquainted with the process of cutting weight is Mike Dolce. Dolce, a Las Vegas based nutritionist who also describes himself as a longevity coach, is regularly hired to assist elite mixed martial artists with their cut. Vitor Belfort, Gray Maynard, Rampage Jackson and Johny Hendricks are just some of the world-class fighters who have reaped the rewards of Dolce’s expertise in recent years. 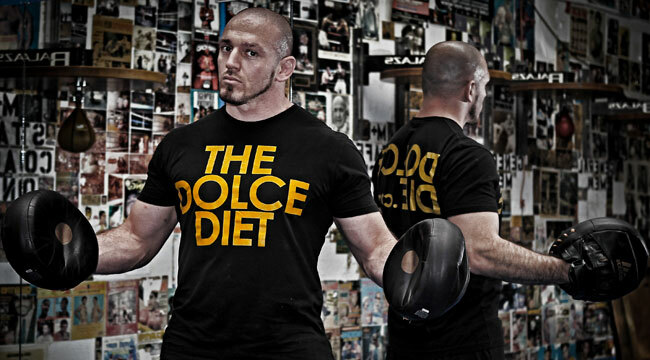 Dolce’s interest in nutrition is a longstanding one and originally evolved alongside his own athletic pursuits as a wrestler, powerlifter and mixed martial artist. Here he gives an introductory overview regarding his philosophy on the art of cutting weight. According to Dolce, the process of cutting weight remains stigmatised because of the somewhat primitive methods that are still in use.